Gilt satin, silk and gilt thread; weaving, embroidery. 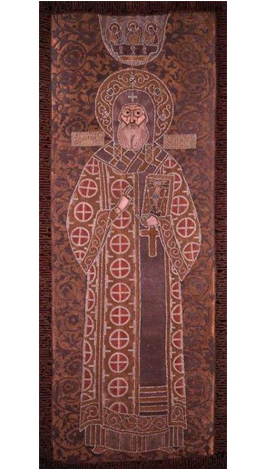 Donated by Archbishop Euphimios of Novgorod in 1441. 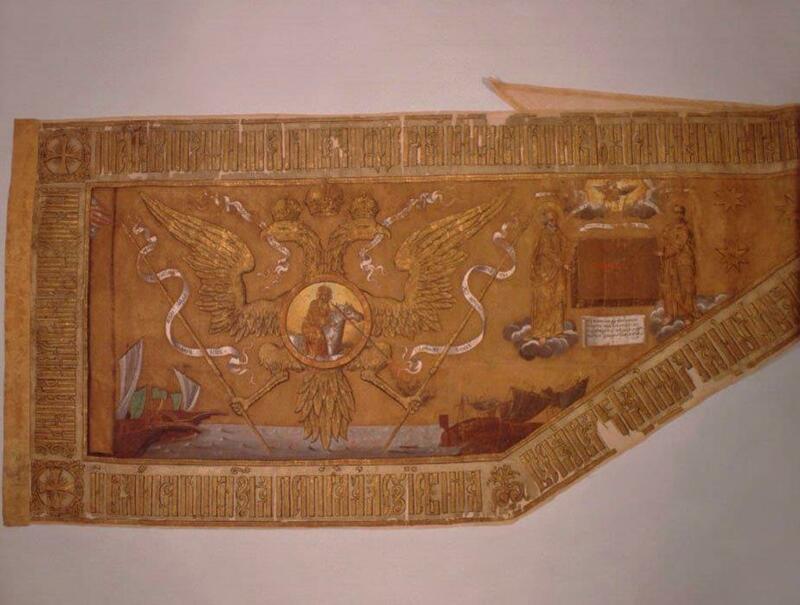 Belonged to Tsar Peter Alexeyevich. Belonged to Empress Catherine I. The suit comprises dalmatic, beshmet, trousers, boots, hat and gloves. 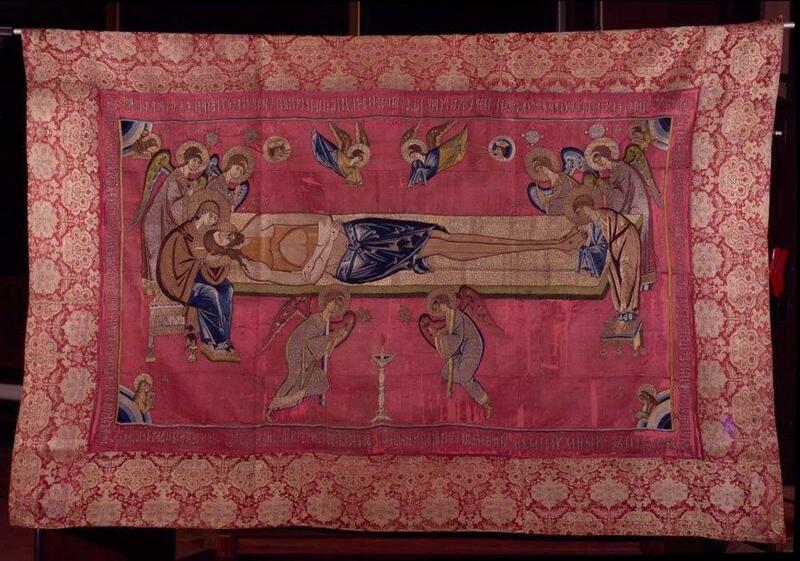 Pall (coffin cloth) "Metropolitan Peter"
Moscow, the Tsarina's Chamber, 1648-69. Cloth - Italy, XVIIth century. The collection of artistic textiles counts about 4000 exhibits. It includes priceless items of secular and religious purpose as well as tapestries, banners and various secular dress accessories. All the items are made of patterned clothes of different kinds. The collection’s chronological frames cover the period from the XIVth to the XXth century. 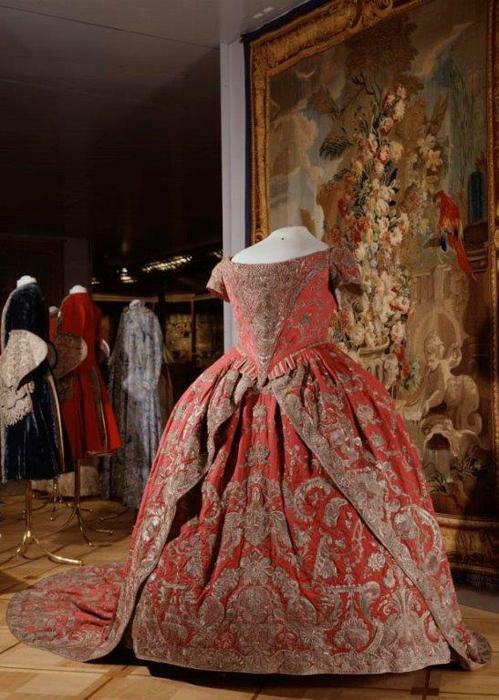 The collection is based on various items used for the decoration of numerous royal ceremonies and official tsars’ everyday life in the XVIth -XVIIth centuries: royal garments, various items of interior furnishing and utencils, banners, ceremonial horse-clothes, saadak covers and many others. 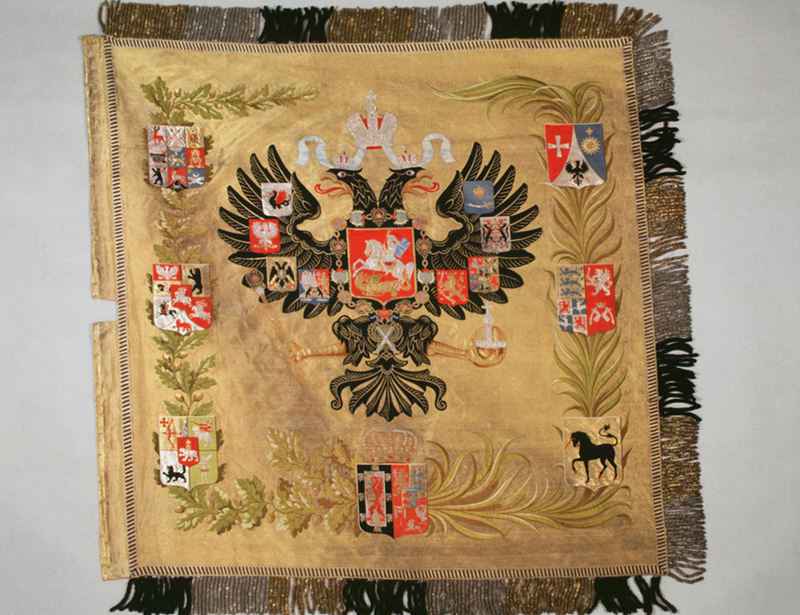 Best masters of the Kremlin workshops created these things of precious textiles brought to the royal treasury from abroad either by purchase or through diplomatic ways. The decoration of the items is distinguished by valuable materials and highly skilled execution. The artistically made items were decorated with gorgeous materials. 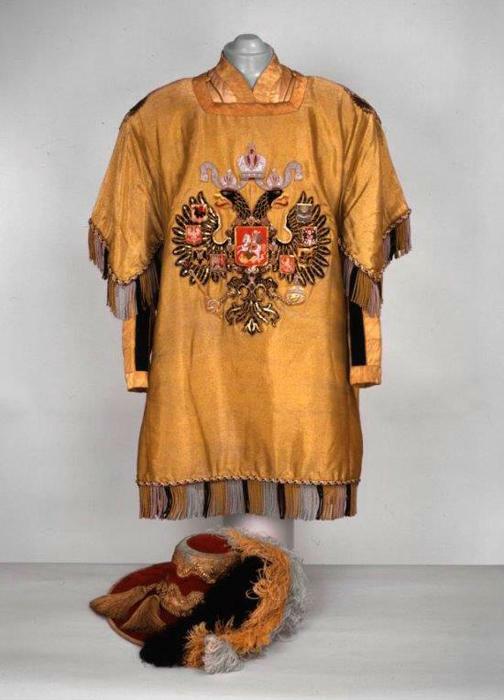 In the XVIIIth - XIXth centuries the museum collection was completed by dresses and suits of Russian Emperors and Empresses as well as various items that were used in coronations traditionally held in the Moscow Kremlin. All these monuments were registered in the museum’s inventory of the XIXth century. In 1920s numerous religious items from Kremlin’s and Moscow’s cathedrals and vestries of the largest Russian monasteries became integrated in the museum collection. Such unique monuments as vestments of Russian Metropolitans and Patriarchs from the Patriarch’s vestry were transferred here. The items of the collection can be divided into six basic groups. Things, connected to the names of Russian Tsars - Mikhail Fyodorovich, Alexei Mikhailovich, Peter Alexeevich (future Emperor Peter the Great) - are of a special interest among the articles of the first group, which is the Old Russian secular dress. The second group of exhibits is represented by multiple examples of so called “mansion attire” of the tsars’ quarters and ceremonial horse trappings of military ceremonies. 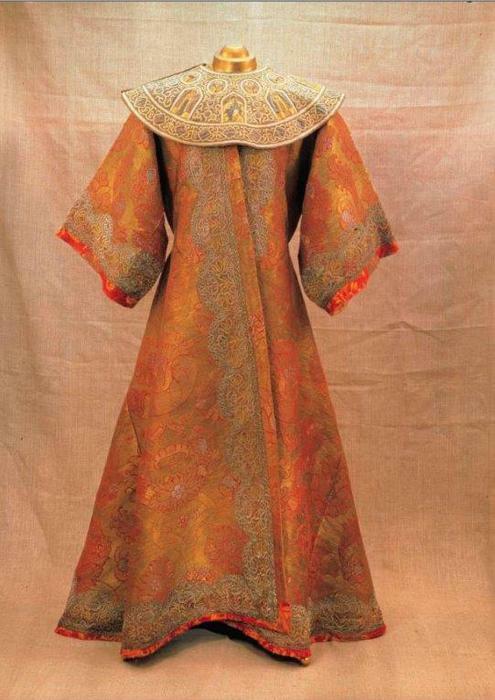 Coronation dresses of Russian Emperors and Empresses and heralds’ costumes form the third group of monuments. Coronation baldachins and numerous official gifts to Russian Emperors and Empresses commemorating their coronations are presented in the fourth group. The fifth group comprises a unique collection of church vestments. There are sakkoses of the Russian Metropolitans’ and Patriarchs’ of the XIVth - XVIIth centuries, priests’ phelonions and deacons’ albs among them. Many of the exhibits are tsars’ presents to the Kremlin cathedrals, Moscow and Russian monasteries. 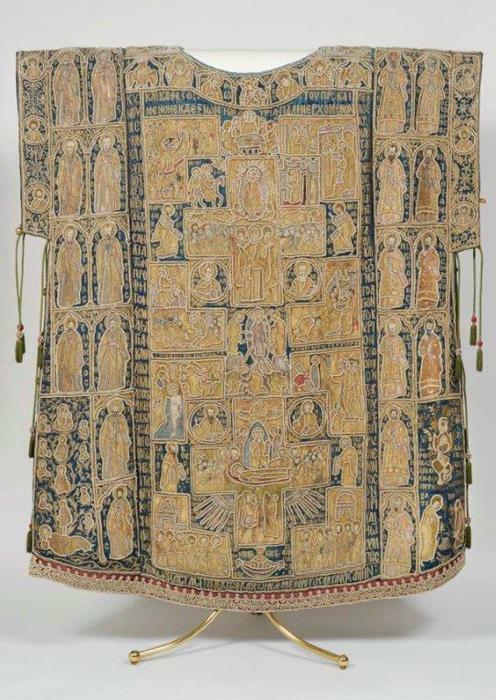 The sixth group is formed of numerous veils, liturgical covers, trappings for the altar and breastwork, shrouds, palls, made of patterned textiles and adorned with pictorial and decorative embroidery. The seventh group of exhibits is the collection of banners. It includes Russian military banners of the XVIth - XVIIth centuries, a number of trophy banners of the XVIIIth - XIXth centuries and four state banners of the XVIIIth - XIXth centuries. West European tapestries of the XVth - XXth centuries, Russian arrasses of the XVIIIth - XIXth centuries and a few tufted carpets of the XVIIth century form the eighth group.